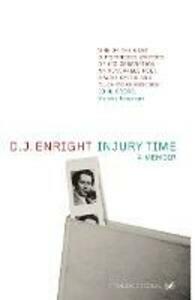 The distinguished poet, essayist and critic D. J. Enright died on the last day of December 2002. He had just put the finishing touches to Injury Time, a memoir and his third commonplace book in which the dying writer muses upon his own condition and that of the world he knows he is leaving. Comparing himself to the Chinese scholar Sima Qian, who chose an 'ignoble punishment' (in Dennis Enright's case, treatment for his cancer; in Qian's, castration) over respectable death in order to finish a book, he contemplates literature, manners, morals, people and, especially, the English language in all its glories and eccentricities - while recording his battle against cancer and his hospital experiences. Moving, and at times deeply poignant, imbued with its author's legendary humanity and wit, Injury Time is, nevertheless, funny, bracing and, above all, positive.